*Includes 12 Novels, 37 short stories, and other non-fiction essays and works. Elizabeth Gaskell (1810-1865) was a well known British novelist at one of the peak eras for female writers in England. A novelist and short story writer at the height of the Victorian Era, Gaskells novels weave a comprehensive, detailed image of the lives of all kinds of different classes in society during that age, ranging from the very poor to the cream of the aristocratic crop. Of course, given the era in which she wrote, Mrs. Gaskells writing included a wonderful style of prose that still continues to please literary critics, even while discussing the general themes of the day like religion and poverty. While novels like North and South dazzled readers, her short stories, particularly Gothic ghost stories, caught the eye of no less a writer than Charles Dickens, who helped get her stories published during the middle of the 19th century. 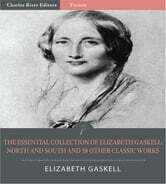 This edition of Gaskells Essential Works is illustrated with pictures of Gaskell, her work and life. It also includes a table of contents for easier navigation.